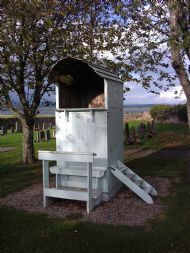 A preaching ark is a portable prefabricated pulpit, used in the remoter areas of the Highlands not least after the Disruption of 1843 when many Congregations broke away from the Established Church to form the Free Church of Scotland. At first, at this time of religious fervour, many congregations were church-less, hence the use of portable arks or ‘preaching tents’ as they were also known. Very few now remain intact. The Edderton Ark is more than ten feet high with its floor nearly four feet off the ground. It is built of vertical timber boarding under a projecting ship-lap roof, with shuttered windows allowing the preacher one hundred and eighty degree visibility. Although the individual sections are heavy, they would have been readily transportable by horse and cart (the original flat pack furniture). The furniture that accompanied the ark also survives, and comprises of two folding Communion Tables and benches, as well as a precentor’s or reader’s table and bench. Although the Ark is undated, this furniture is recorded as having been made in 1822.